I saw this tag on Addlepates and Book Nerds blog (for which I have added some additional songs, courtesy of Jesse the Reader), and the challenge on swxftbooks blog, and I had to do them both. It’s Taylor freaking Swift. And since I’m seeing Taylor for the 3rd and 4th time next month, it’s the perfect time to drop this tag and challenge! I read “Divergent” by Veronica Roth last year, and really quite enjoyed it, so I picked up “Insurgent” earlier this year, and it was diabolical in comparison. It was so disjointed and jumpy, and new characters kept coming and going. It was just bad. Despite that, I hate leaving a series (particularly a trilogy) unfinished, so I’ll probably bite the bullet and read “Allegiant” at some point. I’m not holding out much hope though. One of the five books (yes, five) I’m currently reading is “The Da Vinci Code” by Dan Brown, and the edition I’m reading is a beautiful shade of red – look out for my review next month! “Harry Potter and the Philosopher’s Stone” by J.K. Rowling. Where the magic began, and continues to live on. “Eclipse” by Stephenie Meyer covers this pretty well, I’d say. Falling in love with both a vampire and a werewolf. Doubly forbidden. I recently read “A Court of Thorns and Roses” by Sarah J. Maas (which I loved) and though I didn’t ship Feyre and Rhysand, he’s definitely a bad guy with his own agenda, but he’s so intriguing that I sorta/kinda like him. I am usually very good at avoiding spoilers, but unfortunately I spoiled myself whilst reading “Looking for Alaska” by John Green (the last book I read) as I was reading the 10th anniversary special edition, and I didn’t realise there was a Q&A in the back (which I didn’t even read) which I glanced at and there in bold was the spoiler of the whole book! Ruined in a split second. Callum from “Noughts and Crosses” by Malorie Blackman goes through a crazy amount of character development – in good and bad ways. The book release I’m most excited about this year (and every year she releases a novel) is “Career of Evil” by Robert Galbraith. I loved the first in the series, but was disappointed by the second. Here’s hoping the third picks it back up again! Katniss and Peeta from “The Hunger Games” by Suzanne Collins. They’re the only book couple I’ve ever truly shipped. They bring out the best in each other, although I’m still convinced Katniss got the better deal. That would be my signed copy of “Harry Potter and the Philosopher’s Stone” (again). It’s signed by over 15 actors and actresses from the movies, and is dedicated to me. If I was to choose a different book, it’d be “The Casual Vacancy”, signed by J.K. Rowling when I met her for the first time. The one book that has made me cry above all others is “Marley and Me” by John Grogan. I read it only months after we got our puppy, and it was heartbreaking and beautiful. Ok, I know it was a piece of literary trash, but I loved “Fifty Shades of Grey” by E.L. James. It was highly entertaining! My very favourite stand alone novel, “The Time Traveler’s Wife” by Audrey Niffenegger, was just so beautiful and I loved it a ridiculous amount. I could’ve read and read. Even though I could quite happily talk about ‘Harry Potter’ once again, that series is over, so I’m going with the ‘Cormoran Strike’ books (beginning with “The Cuckoo’s Calling”) by Robert Galbraith, which J.K. Rowling has stated she could easily write more than seven of – so as it’s ongoing, I thought it was more relevant. ‘Love Story’ in 2008. I was 14, sitting in form-time at school with my friend Kelly, and I instantly fell in love with Taylor’s voice. I bought the album ‘Fearless’ when it was released later that year. 2. When did you become a Taylor Swift fan? I wouldn’t say that I became a “fan” until ‘Red’ was released in 2012. That was the album that 100% captured me. ‘All Too Well’ will probably always be my favourite, even though I frequently state others – it is the one I keep going back to, and I absolutely love! ‘Blank Space’, which I think optimises the media and how they can twist even the smallest thing. It’s a genuinely weird video. 5. How many Taylor Swift concerts have you been to? ‘All Too Well’ live. On both occasions I saw Taylor perform the song, it had me so emotional. I don’t have Tumblr. I follow some pretty awesome Instagram fan accounts: @taylorswift_zoe, @lingeringquestion and @sparks_fly_swiftie. ‘Mean’. I know a lot of Taylor Swift fans were bullied when they were kids and teens, and I was one of them – not because I was a T-Swizzle fan of course. To all those bullied – ‘Shake It Off’, you’re ‘Innocent’. 2015’s May calendar entry – the one I’ve been staring at all month. Beautiful. Sometimes I miss the old style songs. I miss that that era has gone (I love ‘1989’, but just occasionally I wish we were back in the ‘Fearless’ days). There can only be one in my mind: Ellen scaring Taylor! This still makes me laugh! Mama Swift laughing is so great too. As an entire album, my favourite is ‘1989’. There aren’t any weak or filler tracks on it, and it is one of only a handful of albums that I actually listen to – my favourite songs are ‘Blank Space’, ‘Style’, ‘Shake It Off’, ‘How You Get The Girl’ and ‘New Romantics’. 14. Have you ever met Taylor Swift? No. I’d absolutely love to at some point – I have my fingers crossed for Loft 89 next month. Pray for me! I hate this question. I’ll go with ‘Treacherous’ because I never really truly loved that song. I really love the UK June 2015 Glamour cover, which Taylor edited. ‘New Romantics’ would definitely have an amazing music video. I’d also love for ‘Starlight’ to have a music video. 18. Who would you want to do a duet with Taylor Swift? Ok, I know this is controversial, and frankly never going to happen, but I’d love for Taylor to collaborate with Katy Perry. Am I not allowed to be a Swiftie and a KatyCat?! Come on, that would be one epic tune! ‘New Romantics’ – and I’ll be hearing it next month! Otherwise (in terms of one I haven’t, and won’t hear) ‘Fearless’. The concerts next month! I’m excited I’m seeing her twice because I know I’ll be fangirling the first time, and not be able to fully appreciate it (like last time). ‘All Too Well’, hands down! I wish I could play that beautifully emotive song on the piano so badly, but I am terrible at music. 24. Which do you prefer; Taylor Swift’s blog, vlogs or tweets? Vlogs! She doesn’t do them frequently enough – understandably as she is ridiculously busy, but I love watching her videos. 25. Do you have any Taylor Swift merchandise? Yep. 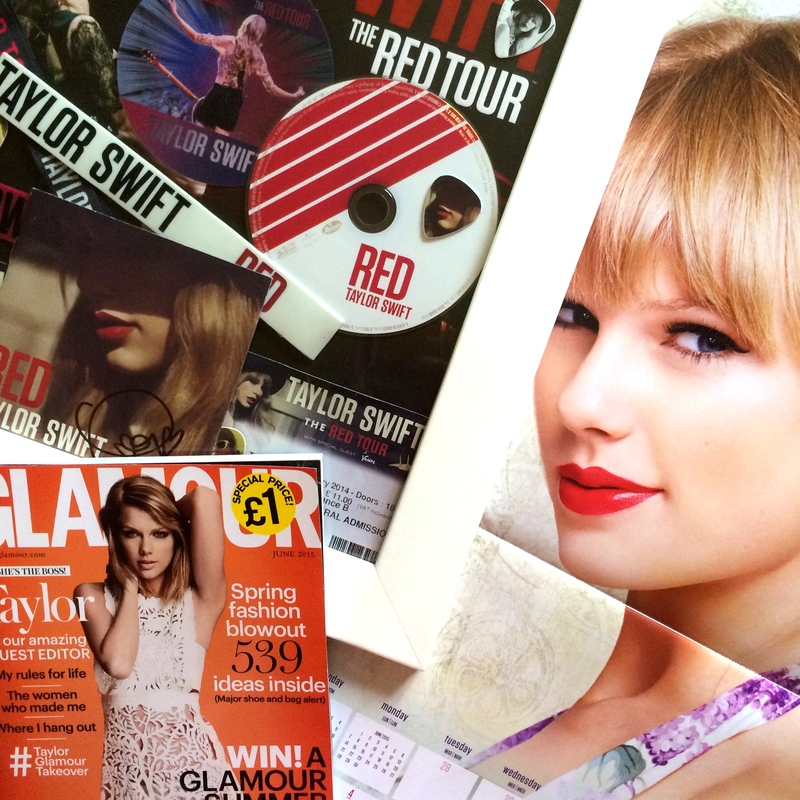 I have a signed ‘Red’ album insert, wristbands, blanket, t-shirt, guitar picks, and I’m pretty sure I have a glo-stick somewhere – and I’ll be getting ‘1989’ merch at the tour! I also have several magazines with her as the cover star. Taylor’s first trip to London was pretty memorable – I loved her in the Foot Guard uniform! At the moment I’m addicted to ‘Starlight’ but there are eleven I could listen to day-in, day-out, and not get bored of: ‘Fearless’, ‘Our Song’, ‘Sparks Fly’, ‘All Too Well’, ’22’, ‘We Are Never Ever Getting Back Together’, ‘Blank Space’, ‘Style’, ‘Shake It Off’, ‘How You Get The Girl’ and ‘New Romantics’. 28. How has Taylor Swift influenced your life? I wouldn’t go as far as saying she has influenced my life, but there is a TSwift song for every emotion. She can make me happy when I’m sad, and feel like I’m on cloud nine when I’m jamming to her songs. She puts on an amazing show, and seems like a genuinely lovely person. I can’t wait to see where Taylor goes in the future! Swifties for the win! That was so much fun! 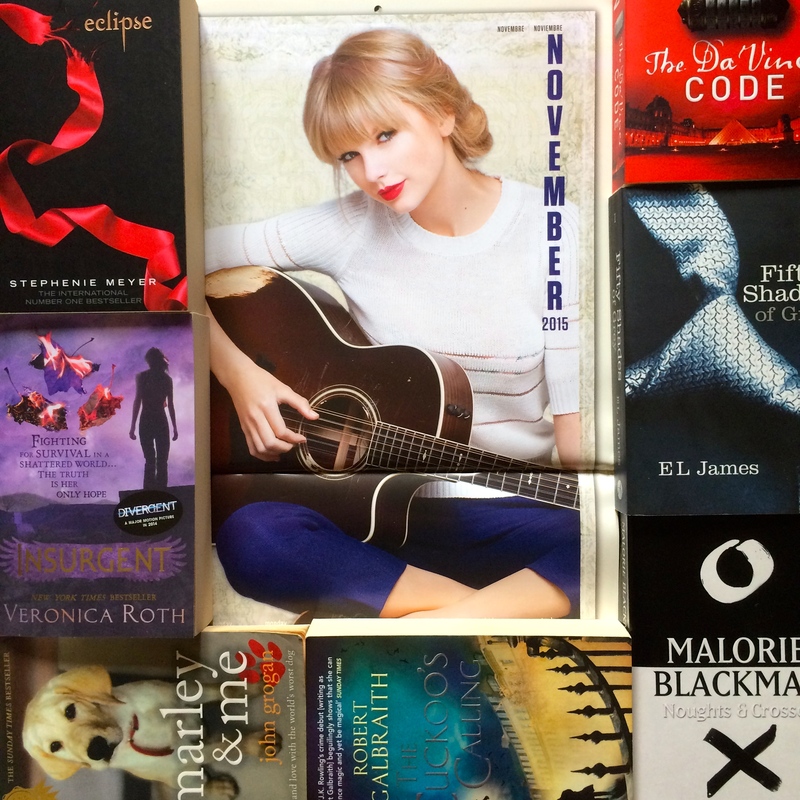 If you’re a Taylor Swift fan, and you fancy doing either challenge, consider yourself tagged!